Model Ship Display Suggestions and Recommendations. A ship model should be protected from dust and grime. 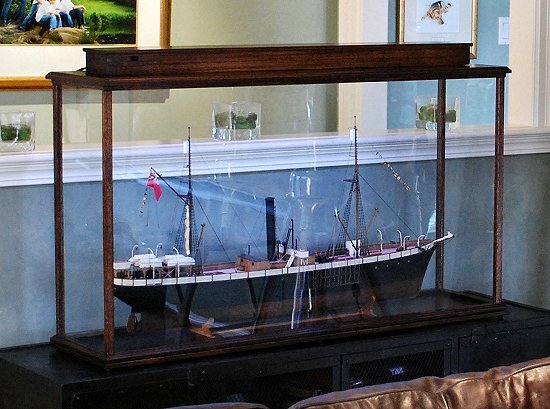 A good and proven way to display a model ship is under glass or acrylic. Any display case should, as a general rule, be at least 2" (50mm) larger in width, height and length than the model dimensions. 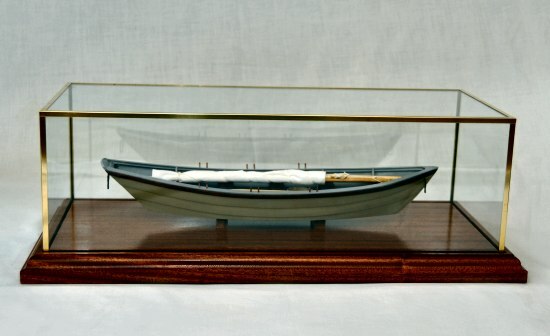 To display a model with a bowsprit, you may want to consider leaving more clearance at the stern for a more "balanced" look. Real glass is more durable and less susceptible to heat and sunlight, however the lesser weight and the clean, clear beveled edges of an acrylic case have its own advantages. For optimum security, consider the use of tempered glass. It would be very sad if a ten dollar piece of glass would destroy your priceless model. Just be aware that tempered glass may have a slight greenish tint and can have optical flaws. Oak display case with remote controlled top and bottom low-heat LED lighting. Acrylic is optically very similar to glass. With good care, such as cleaning with a soft cloth, not paper towel, the acrylic will last for many years. More ship model cleaning and maintenance suggestions can be found on our maintenance page. 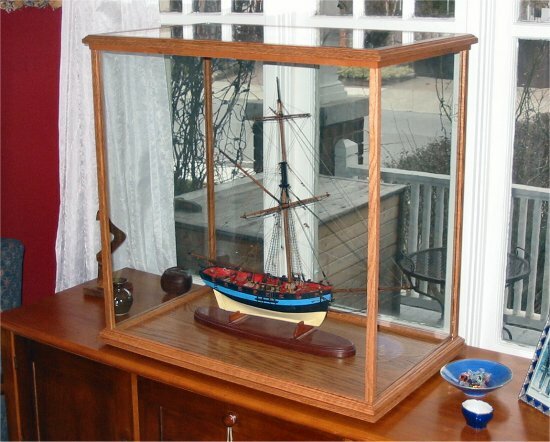 Cherry display case with a wood and glass top displaying an 18th century cutter. 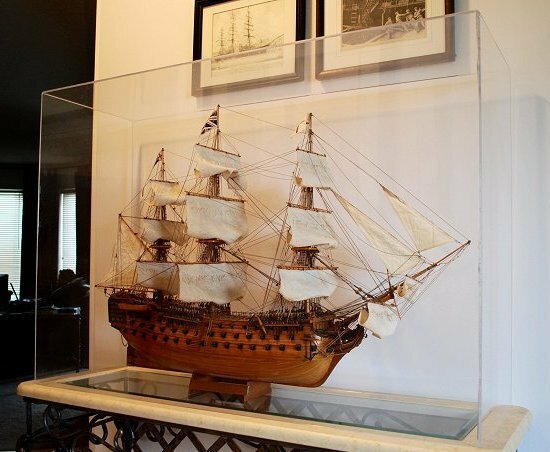 For a quality wood and glass case for your ship model we suggest Houston Display Furniture. 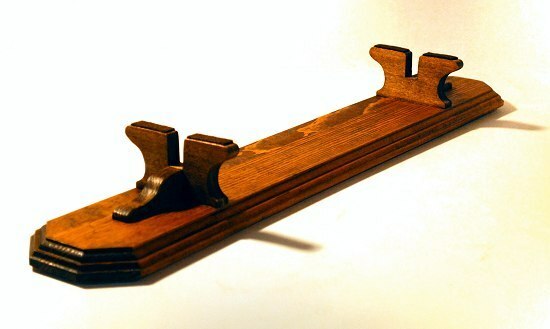 They will also be able to build you a standard or custom display stand to match or compliment your display case. Their display cases and stands come flat packaged and are easily assembled. You simply order and add glass locally. If a fully assembled glass/acrylic and solid brass display case is what you prefer, Clear View Designs will have the quality display case you're looking for. 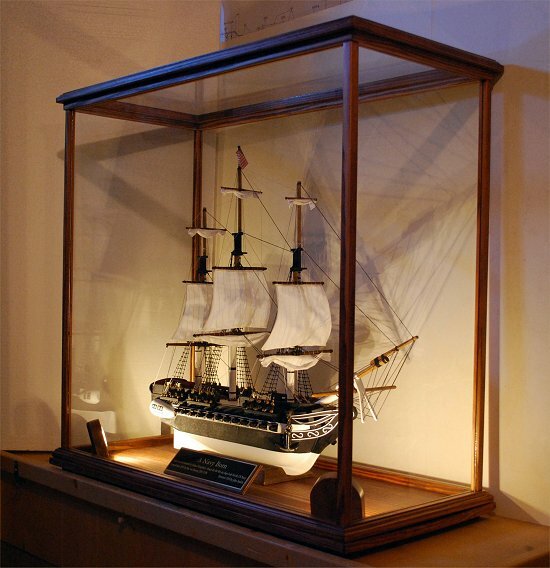 HMS Victory model under a large acrylic cap with clear beveled edges. Even though a case will keep your model dust and dirt free, lighting can really bring a display to life. 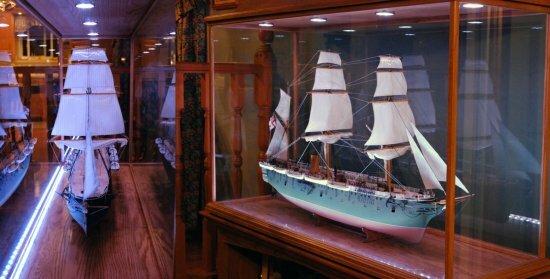 Lighting from above and slightly in front can be used to make your model ship the center of attention, even in the most prestigious of settings and could be effectively applied when displaying your model in an alcove or large cabinet. 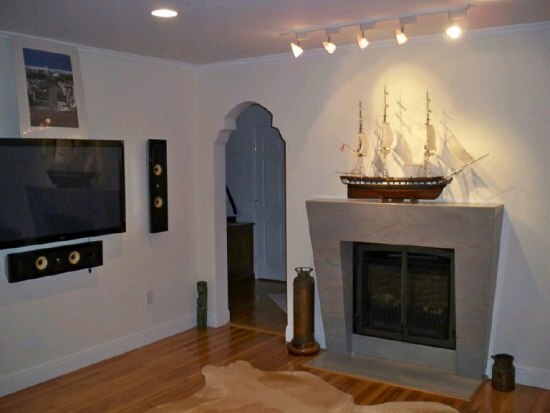 Displaying a model over a fireplace as shown below, may be an option, but only if the space directly over the fireplace stays relatively cool. Internal display case lighting can also be applied with spectacular result. Do make absolutely sure however that the lighting you plan to use emits as little heat as possible. I recommend using low-voltage LED systems for any in-display-case lighting solution. Any lighting system emitting little heat is preferable and even crucial to the lifespan of both model and display case. Other benefits of using LED lighting are that the color-temperature and intensity can often be changed or selected with the help of a remote control, and the additional bonus of normal LEDs being void of any color-fading ultraviolet emissions. Mahogany display case with remote controlled LED spot lights and tempered glass. The image above shows a Bombay mahogany display case with remote controlled LED lighting allowing the lighting to be turned on or off, the color of the lighting to be changed and the lights to be dimmed. Using multiple light sources is almost always preferred over using a single point of light. Use from 2 - 8 lights or multi-light modules, depending on the size of the display. 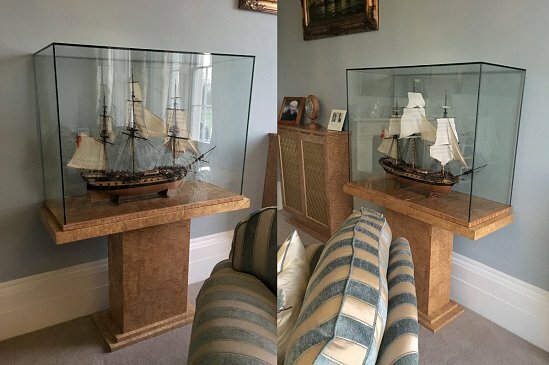 Custom model stand created for a large antique flat-bottom boat model. Venting the case and drawing away heat from the interior is never a bad idea. A well designed display case will have some venting calculated in. A hermetically sealed enclosure may become an oven for your model to bake in when exposed to sunlight. Douglas Fir display case with glass top and custom LED 'Tombstone' lighting. The lighting system shown above only uses about 6 Watts in total. Avoid using fluorescent lighting as it will usually make for a dull and flat display. Fluorescent lighting is great for above a work bench, not so much for use in a model display. LED strips or modules can be used to almost completely hide the lighting into a display case. The drawback here can be somewhat the same as with fluorescent lighting, too many points of light destroying the shadow and highlight effects and creating a dull display. 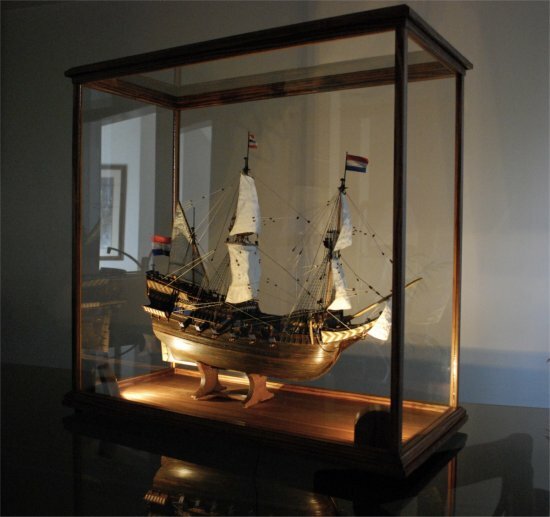 *The Art of Age of Sail receives no incentives for mentioning or promoting the display case and stand manufacturers mentioned on this page, we simply trust and like their products.